Burn VOB to DVD/ISO/DVD Folder/Blu-ray DVD easily. Edit videos before VOB to DVD conversion. Customize DVD template for VOB to DVD. VOB is a container file format in the DVD-Video media and is the main content of the DVD Folder. A VOB file contains video, audio, menu, subtitle, and contents about navigation. If you love watching videos, then you are sure to have a large number of these files on your PC that occupies a lot of disk space. So to declutter your system, create some disk space and create backup of your files, VOB to DVD conversion is the best solution. The following part of the topic discusses the best solutions to burn VOB to DVD. 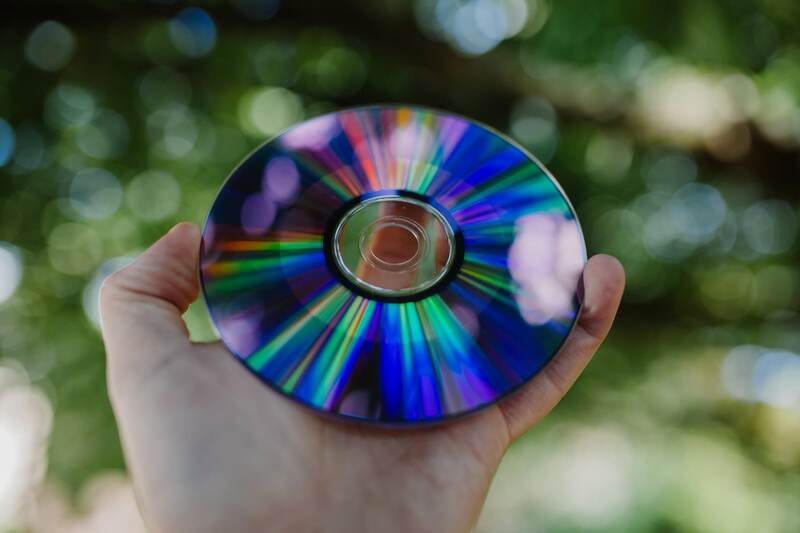 Nothing can beat the quality, speed, and features offered by professional software when it comes to DVD burning and Wondershare DVD Creator is the best to burn VOB files to DVD. Compatible with all latest versions of Windows and Mac system, the software supports a wide range of formats for disc burning in high quality. Support burning DVD and Blu-ray disc from VOB and other video files at a quick speed. All popular disc types are also supported. Convert VOB to DVD folder or ISO image files. Multiple VOB files or files with different formats can be burned to a single disc at a time. Allow creating a DVD project file that can be used for quick editing anytime. Built-in video editor with trim, crop, watermark, and other features. Offer a wide variety of DVD templates to create professional looking discs. DVD template customization is also possible by adding background image/music, changing thumbnails, creating chapters, and other features. Additional toolbox helps to burn Data Disc, ISO to DVD, create photo slideshow, copy DVD, edit videos, convert DVD to video, etc. Step 1 Open Wondershare VOB to DVD Converter. Download, install, open Wondershare DVD Creator on your PC. A window like below will appear. Select the option of Create a DVD Video Disc. There is also an option for creating Blu-ray Disc if you need. Step 2 Import and edit VOB files. To load VOB files to the software interface, click " + " button under the Source tab and browse for the videos on your PC. The added videos will be shown as thumbnails on the left column. Multiple VOB files can be added. You can also arrange the order of the videos. To edit and personalize VOB files before burning, click the pencil icon on the desired video thumbnail. You can also right-click the video and select the Edit option. 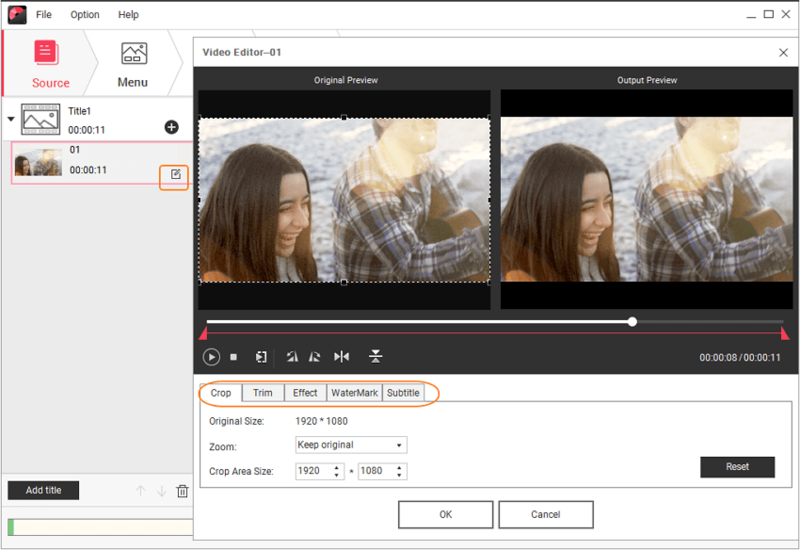 A Video Editor window with Crop, Trim, Effects, Watermark, and Subtitle options will appear. Make changes to your video and click OK to confirm. Step 3 Choose DVD Menu templates for VOB to DVD conversion. Select the Menu tab. The menu structure will appear on the left and the list of available template designs will be shown in the right column. Move through the designs and double click to apply the most appropriate one. If nothing suits you, click the download icon to download more template designs. The screen interface shows the icons for changing aspect ratio, creating chapters, adding background image/music, and others. Select the icon for needed function and customize the template. Step 4 Preview DVD disc and convert VOB to DVD. Click the Preview tab from the primary interface. A window to let you preview the created disc will open. You can check if all are fine and as per your requirements. If some changes are needed, you can go back to the respective tab and do so. Next, move to the Burn tab and a Burn Settings window will appear. Insert a blank disc into your PC and select Burn to disc option. Enter Disc Label and choose other DVD parameters. Finally, click Burn and the process to convert your VOB files to DVD disc will start. Wondershare software to burn your VOB files to DVD and offer additional video features as well is Wondershare Video Converter Ultimate. Compatible working with Windows and Mac system, the software is a complete video tool-box with options to convert, record, download, burn, and transfer files to devices. So for all your video related needs, Wondershare Video Converter Ultimate is one-stop solution. Works as an excellent tool to copy VOB file to DVD in high quality and at super fast speed. Allows burning VOB and range of other file formats to DVD disc, Blu-ray disc, DVD Folder, and ISO image files. Offers 20+ free DVD menu templates to choose from. Allows adding background image or music to your disc to create a professional look. Customize DVD template by editing DVD title, adjusting font, size, and others parameters. Complete built-in video editor to personalize video files before burning. Allows downloading videos from more than 10,000 sites including YouTube, DailyMotion, and others. Additional features include video recording, video transfer between a number of devices, and others. Step 1 Run Wondershare tool to convert VOB TO DVD and load VOB files. Open Wondershare Video Converter Ultimate program on your PC/Mac. From the primary interface, select the Burn tab. On the left corner, click +Add Files to add VOB files from your PC. You can also drag and drop the files. The added files will appear as thumbnails with video details on the left column. The editing icons are present under the video thumbnail for video personalization. 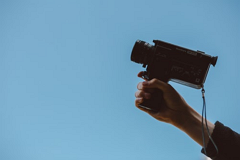 You can trim the unwanted parts, crop, rotate, add watermark, or add subtitles through video editing window. 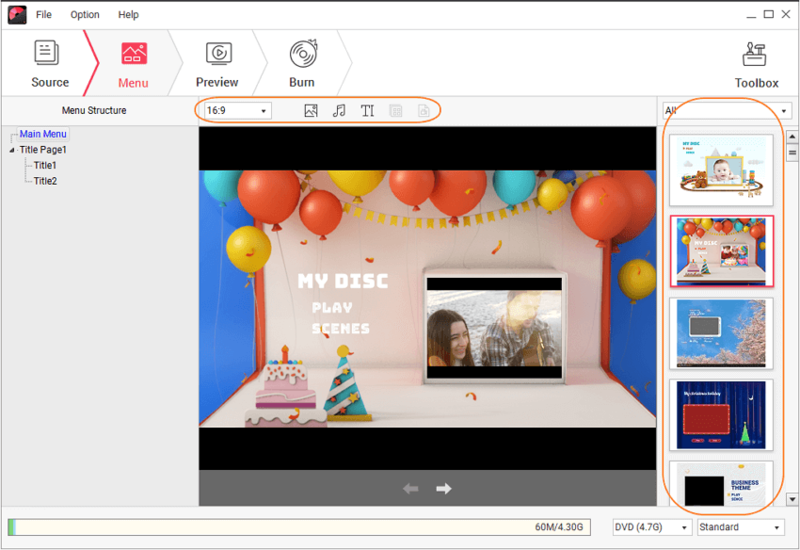 Step 2 Select DVD template and customize it. The right column of the interface shows the available free template designs. Move the left and the right arrow to check for the designs that suit your theme. Click the pencil icon on the right side of the templates, to open a new window for template customization. Next, give the desired name to your created disc at DVD Label column. Choose other parameters like Menu Type, Aspect Ratio, TV Standard, and Quality. Step 4 Burn VOB files to DVD or convert VOB to DVD folder or ISO image. Open drop-down menu at Burn Video to: column on the top-right corner. Select from the given option to burn your files to DVD disc, DVD Folder, or ISO image files. Finally, click the Burn button to start converting your VOB files to the desired location. Above listed are two professional software to convert VOB to DVD. Depending on the number of videos, features needed, and other requirements, you can make a choice between the two. A comparison table below will help you in your decision. DVD Template customization Yes, with a range of features like adding background image/music, editing aspect ratio, customizing thumbnails, and others. Basic DVD template customization features like background image/music. There are a number of free software to burn VOB files to DVD are also available. But they cannot beat the features, quality or any other aspect of professional software like Wondershare. 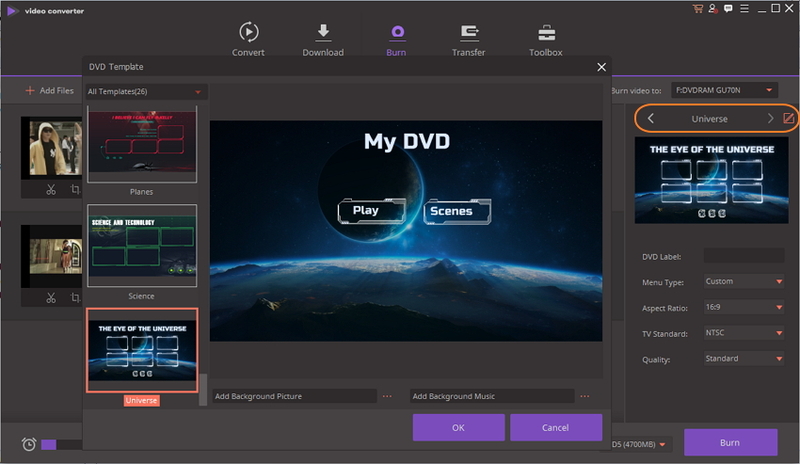 Install Wondershare DVD Creator or Video Converter Ultimate and enjoy watching excellent quality discs at your DVD player.